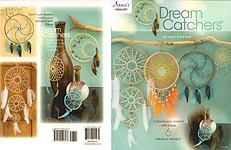 Crochet Dream Catchers, designed by Bendy Carter, Annie's, 2017. Projects made with #2 nylon cord, beads, and feathers include: Pure Gold, Star Feather, Swirling Wheat, Lone Feather, Featherd Bonnet, Moon Phases. BRAND NEW 2017 RELEASE! Plant Pot Holders, designed by Michele Wilcox, Annie's Attic, 1990. 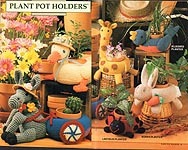 Designs to crochet in worsted weight yarn include: Duck Planter, Giraffe Planter, Bluebird Planter, Bunny Planter, Ladybug Planter, Donkey Cart Planter, Frog Planter. 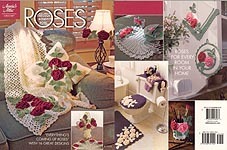 Annie's Favorite Home Decor Projects, Annie's Attic, 1999. 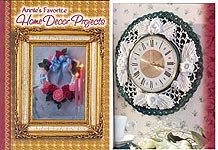 Hard-cover book; designs include: Pretty Parlor -- Irish Wall Clock, Floral Set, Luncheon Cloth, Victorian Wreath, Parlor Perk- Up, Tassel Trimmings; Boudoir Basics -- Delicate Lampshade, Picture Mat, Vanity Set, Rose Trellis Bedspread, Boudoir Pillows, Lady's Fan Set; Holiday Home -- Cardinal Pillow, Rag Wreaths, Poinsettia Afghan, Nutcracker Duo, Angel Doily, Snowflake Potholders; Dining Decor -- Grape Basket, Mini Mats, Bellflower Tablecloth, Luncheon Decor, Motif Tablecloth, Spiderweb Set, Sideboard Cover; Kitchen Charm -- Round Rug, Kitchen Cutie Bag Holder, Chicken Place Mat Set, Countryside Curtain, Country Apples Set, Collectible Thread Potholders, Heart & Home Set; Beautiful Bath -- Swan Lake, Ribbon 'n' Bows Bath, Tissue Hanger, Cameo Bath Set, Shells 'n' Bows; Kid's Stuff -- Sparkler Rug, Happy Hangers, Stork Wall Art, Kitty Caddy, Clown Nursery; Afghans All Around - Lap Afghan, Fans Afghan, Striped Afghan, Spring Flowers, Diagonal Cables, Loop & Lace, Rose Filet. Excellent condition. Crochet Tank Top Tissues, designed by Estella Whitford, The Needlecraft Shop, 1992. 6 toilet tissue covers in worsted weight yarn: Bearly Fishin', Cowpoke Pig, Pretty Kitty,Farmin' Bunny, Pokey Puppy, Toad Froggert. Center staples slightly rusty, but otherwise like new. Crochet! 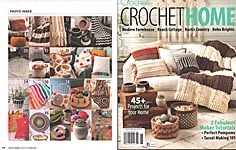 Magazine Presents Crochet Home, Crochet Magazine, April 2019. Designs include: MODERN FARMHOUSE -- Sampler Pillow, SBanded Cable Throw, Linked Loops Pouf, Fringed Throw, Woven Stitch Basket Set, Step- By- Step Afghan, Stone Garden Rug, KNotted Fringe Pillow, Wicker Weave Basket, Corolla Mini Bowls; BOHO BRIGHTS -- Pompom Throw, Pop of Color Pillow, Potted Plant Hanger, Boho Stripes Blanket, Bliss Pillow, Boho Basket, Octie Throw, Carribean Cabana Lights, Retro Mandala, Slice of Color Coasters, Haworthia Succulent, Jubilant Table Runner; BEACH COTTAGE -- Cottage Life Throw, Beachside Wall Hanging, Sand Dollar Throw, Ripples in the Sand Pillows, Tweed Dish Covers, Beach Cottage Pillows, Tropic Island Table Mat, Seashell Basket, Seagrass Rug, Sand Dunes Throw; RUSTIC COUNTRY -- Granny's Gingham Lapghan, Indigo BLues Coasters, Country Living Table Runner, Woven Stripes Denim Rug, Log Cabin, Woven Basket, Pillow Ticking Kitche Set, Country Roads Throw, Splatterware Basketsk, Microwave Bowl Cozy; ARTICLES -- Perfect Pompoms, Tassel Making 101. BRAND NEW 2019 RELEASE! My Sleepy- Time Friends Crochet Pillows, designed by K. Calliste Hawke, Annie's, 2018. 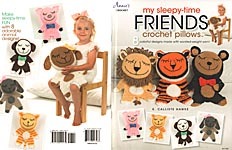 Designs include: Bear, Bunny, Doggie, Kitty, Lamb, Lion, Tiger, Piggy. BRAND NEW 2018 RELEASE! 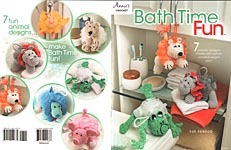 Bath Time Fun, designed by Sue Penrod, Annie's, 2018. Designs in worsted weight cotton yarn to sew to bath puffs include Dog, Duck, Pig, Frog, Hippo, Lion, & Bear. BRAND NEW 2018 RELEASE! Stash Baskets, designed by Laura Hontz, Annie's, 2016. One design in three sizes, to crochet in worsted weight yarn. BRAND NEW 2016 RELEASE! Baskets for All, Annie's, 2015. 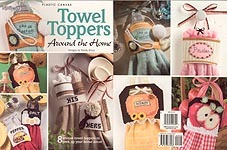 Designs in a variety of yarn sizes with both written instructions and symbol charts include: Owl on Guard, Colorful Chevrons, Lacy Elegance, Stylish Storage, Hanging Around, Go Team!, Textured Perfection, Woven Wonder. BRAND NEW 2015 RELEASE! Fanciful Tissue Box Covers, designed by Annie Potter, Annie Potter Presents, 2009. 4 designs to crochet in worsted weight yarn for boutique tissue boxes: Victorian Beauty, Blue Danube, Bright Bouquet, Lace Fantasy. BRAND NEW! Victorian Lace Bedspread, designed by Diane Simpson, Annie's, 2015. Crochet in worsted weight yarn for any size bed. BRAND NEW 2015 RELEASE! Home Sweet (Crocheted) Home, Coats & Clark, 2012. Instructions in both written and symbol crochet using a variety of crochet cotton and yarn sizes include: Dancing Doilies Tablecloth, Popcorn Stitch Scrubbie, Everyday Dishcloths, Mini Tomatoes, Crocheted Cacti, Creativity Baskets, Woodsy Acorn Pots, Elegant Runner, Tea & Cupcakes tea cozy, Granny Slippers, Shimmery Afghan. BRAND NEW! 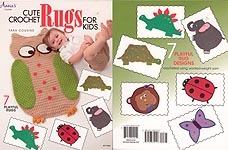 Cute Crochet Rugs for Kids, designed by Tara Cousins, Annie's, 2014. 7 designs in worsted weight yarn: Give A Hoot Owl, Bella Butterfly, Granny Shell Turtle, Baby Elephant, Mischievous Monkey, Sammy the Stegosaurus, Spots the Ladybug. . BRAND NEW 2014 RELEASE! 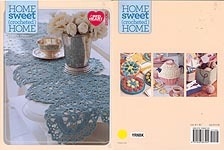 Lovely & Lacy Home Decor, designed by BellaCrochet, Annie's Attic, 2003. 6 pansy- inspired designs in size 10 crochet cotton include: Pansy tassle, Picture Frame Trim, Potpourri Bowl, Dresser Scarf, Air Freshener Doll, and Sachet. Brand New! 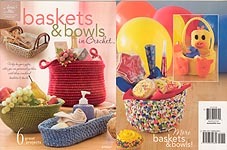 Baskets & Bowls in Crochet, designed by Darla Sims and Jocelyn Sass, , Annie's Attic, 2009. 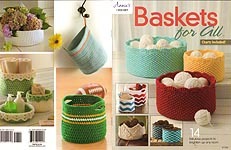 6 great projects include: Clothesline Crochet Basket, Oblong Basket, Large Round Bowl, Party Bowl, Jute Basket, and Duck Basket. Brand New! 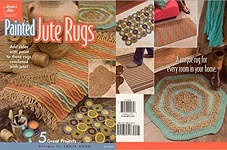 Painted Jute Rugs, designed by Sonja Hood, Annie's Attic, 2010. 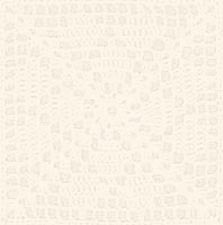 5 designs; add color with paint to rugs crocheted with jute! Brand New! 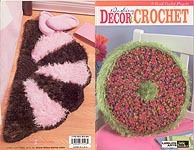 Dashing Decor to Crochet, Leisure Arts Little Books, 2005. 5 quick projects in worsted, bulky, and super bulky weight novelty yarns include: Pillow, Granny Afghan, Table Scarf, Textured Wall Art, and Rug. Brand New! 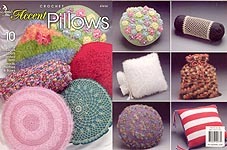 Crochet Accent Pillows, designed by Sue Childress and Frances Hughes, Annie's Attic, 2003. 10 projects using fabulous fibers accented with beads, butterflies, and bows. Brand New! 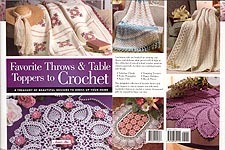 Favorite Throws & Table Toppers to Crochet, Annie's Attic, 2006. 304- page spiral- bound hardcover book, containing close to 100 beautiful designs to dress up your home. Chapter headings include: Tempting Tesxtures, Happy Holidays, Bits & Pieces, Fabulous Florals, Pretty Pineapples, and Fancy Filet. Brand New! Note: Additional postage required for shipping outside of the US. 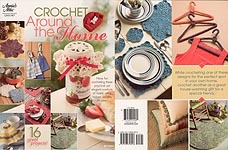 Crochet Around the Home, Annie's Attic, 2010. 16 great projects: Spider-web Place Mat, Shadow-Box Trellis Afghan, Couch Tissue Box Cover, Towl Tenders Kitchen Naturals, Jar Topper, Lovely Tablecloth, Fallen Petals Afghan, Delightful Doily, Variegated Rug, Rhapsody in Rose Afghan, French Dishcloth, simple Place Setting, Summer Skies Afghan, Easy Covered Hangers, and Delicate Edgings. Brand New! 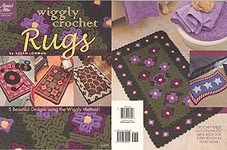 Wiggly Crochet Rugs, designed by Susan Lowman, Annie's Attic, 2009. 5 beautiful designs worked in a combination of Luster Sheen and worsted weight yarn, using the Wiggly Method. Brand New! 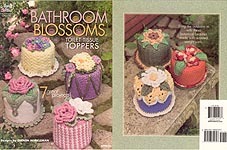 Bathroom Blossoms Toilet Tissue Toppers, designed by Glenda Winlkeman, Annie's Attic, 2009. 7 projects in worsted weight yarn include: Morning Rose, Cactus Flowers, Sunflower, Carnation, Garden Roses, Cornflowers, and Daisy. Brand New! Pamper Yourself, Annie's Attic, 2007. 16 projects include: Shoulderette, Slippers, Jewelry Roll, Hanger Cover, Floral Washcloth, Headband, Back Scrubber, Basket, Flip- Flops, Bath Mitt, Soap Holder, Bath Puff, Pineapple Candle Mat, Pineapple Coaster, Pineapple Bookmark, and Potpourri Holder. Brand New! Bath Sets, Annie's Attic, 2009. 3 colorful 5-piece sets using worsted & sport weight yarn. 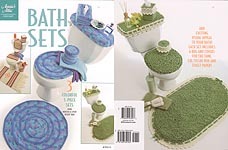 Each set includes: Seat lid cover, tank top cover, tissue box cover, toilet tissue cover, and rug. Brand New! Ultimate Book of Pineapples, Annie's Attic, 2001. 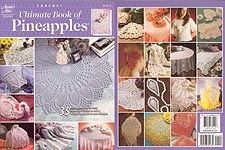 35 pineapples used in every form and fashion, in both thread and yarn: doilies, edgings, table cloths & runners, afghans, purses, shawl, beaded top. pineapple butterfly hair clip, bedspreads, tissue holder, swan appliques for towels, earrings, sculptured swan, baby sweater & cap, hot pad, poncho, valence, and more! Brand NEW! 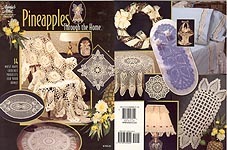 Annie's Attic Pineapples Through The Home, Annie's Attic, 2008. 14 must-have projects, including: a gorgeous Angel; lampshade cover; afghan; round tableclothl doilies in a variety of shapes, colors, and sizes; wreath; basket; tissue box cover; runners; rug, and edgings. Brand NEW! 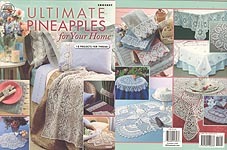 Ultimate Pineapples For Your Home, American School of Needlework, 2004. 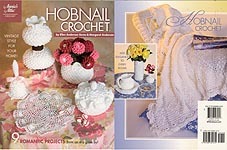 18 projects in crochet thread, including: doilies, tablecloths & toppers, bedspreads, and 8 edgings for pillowcases, placemat & matching napkin ring, towels, curtain tiebacks, etc. Brand NEW! Annie's Attic Roses Through The Home, Annie's Attic, 2007. 16 great designs, for every room in your home, including: Afghan, Pillow, Doily, Lampshade Trim, Basket, Placemats, Potholders, Salt & Pepper Shaker Covers, Napkin Ring, Hook Holder, Toilet Seat Cover, Tank Runner, Tissue Box Cover, Rug, and Towel Trim. Brand NEW! In-Style Crochet for the Home, designed by George Shaheen, American School of Needlework, 2005. 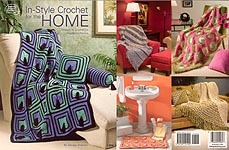 63 pages of exciting and contemporary crocheted home accessories, including afghans, pillows, towel edgings, rugs, etc. Brand NEW! Annie's Attic Hobnail Crochet, designed by Ellen Anderson Eaves & Margaret Anderson, Annie's Attic, 2007. 9 Milk Glass look projects in yarn and thread include: Afghan, Doily, Pitcher & Bowl, Lamp, Bell, Bowl of Mums, Candy Dish, Tall Vase Cover, and Bud Vase. Brand NEW!